It’s becoming no secret that I have a thing for tequila (exhibit a, b, and c). Though wine still holds a special place in my heart, margaritas may just be my favorite drink. So it’s no wonder I keep dreaming up new flavor combinations. This particular recipe was inspired by a trip to visit friends in D.C. last summer. We went to a bottomless brunch (yes, all you can eat and drink!) at a Mexican restaurant where they served boozy hibiscus agua fresca. Oh dear – so good. I couldn’t shake the tart, sweet, refreshing beverage from my mind. I had to recreate it. This is my spin. 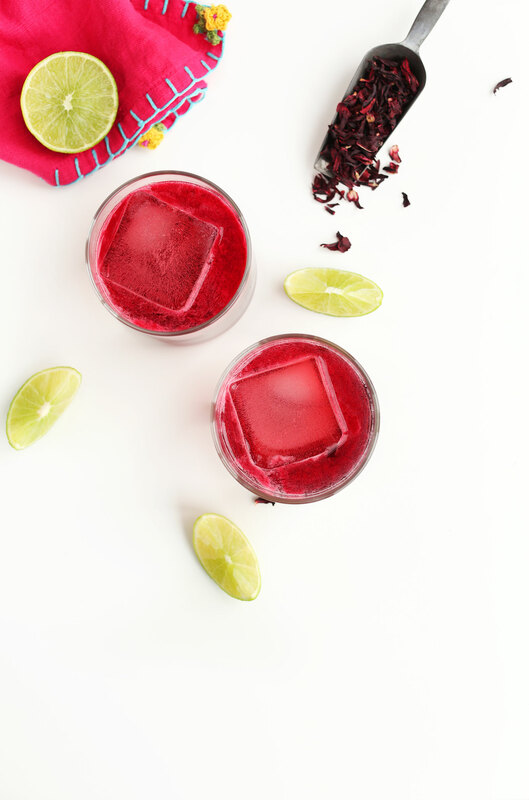 This drink starts out with the hibiscus tea concentrate made from hibiscus tea, water and your sweetener of choice. 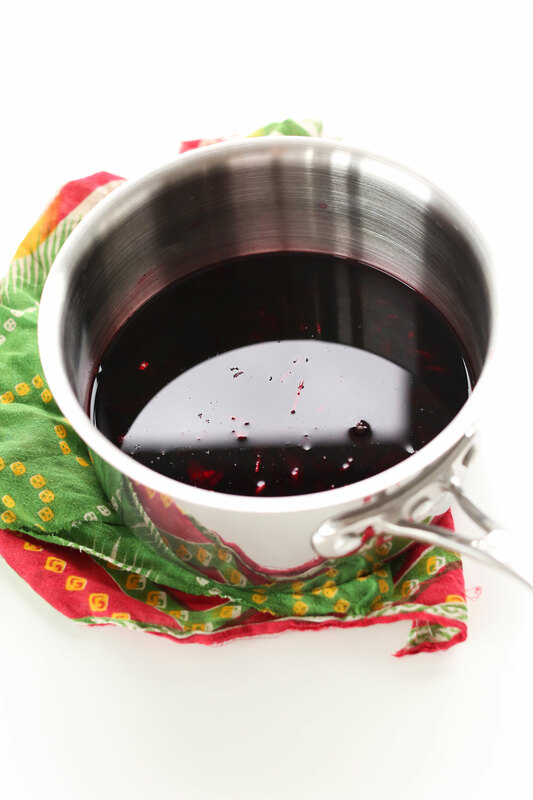 The whole process is quick and painless and yields a gorgeous, deep magenta hibiscus tea concentrate perfect for adding a floral, tart-sweet punch to your favorite cocktails. The best part about this cocktail besides the fact that it’s tea based and practically health food? THE COLOR. Can we say happy valentine’s day? Hello hot pink goodness. I’m just spilling all my secrets today. Hi. My name’s Dana and I love tequila, hot pink, and all the chocolate. Share this drink with friends over tacos on Mexican night – that’s what I did (you’re welcome, friends). Or, mix one up for your favorite Valentine. They’ll be sure to love you forever. Tequila seems to have that effect on people (wink, wink). Cheers, friends! Loved this recipe? Share it! Take a picture and tag it #minimalistbaker on Instagram. We’d love to see! 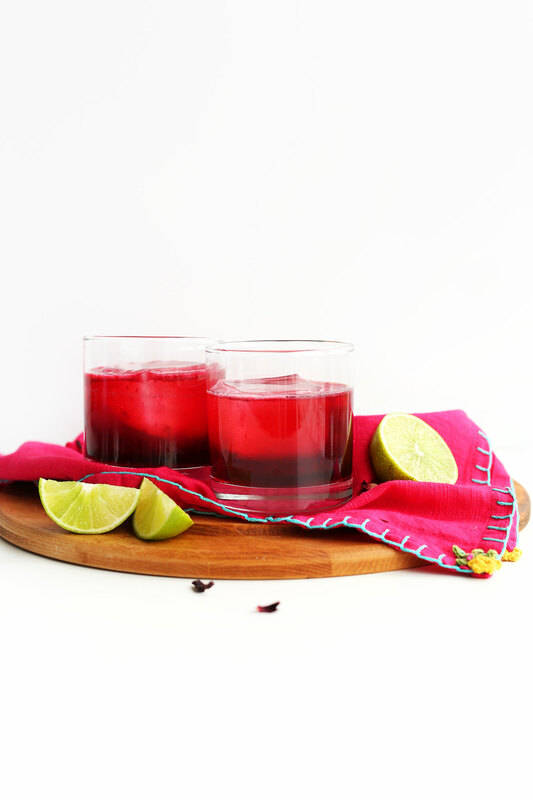 Simple 5-ingredient margaritas infused with hibiscus tea concentrate, giving it the perfect tart, sweet finish. Complex, delicious, and pairs especially well with Mexican food. 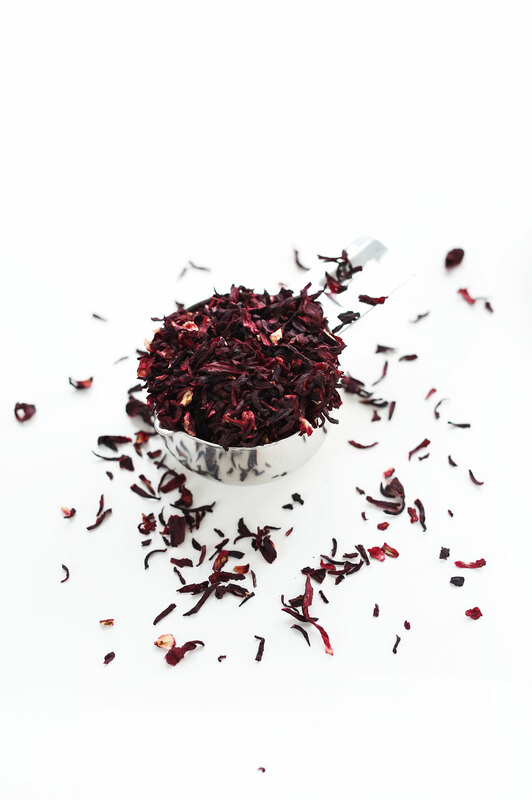 To make the hibiscus tea concentrate, bring 3 cups water to a boil, add hibiscus tea, stir, remove from heat and let steep for 30 minutes. Strain into a jar or glass container using a fine mesh strainer and add sweetener to taste. I found 1/3 cup (amount as original recipe is written // adjust if altering batch size) was about the right amount, using half agave nectar, half cane sugar. Stir to dissolve and let cool. 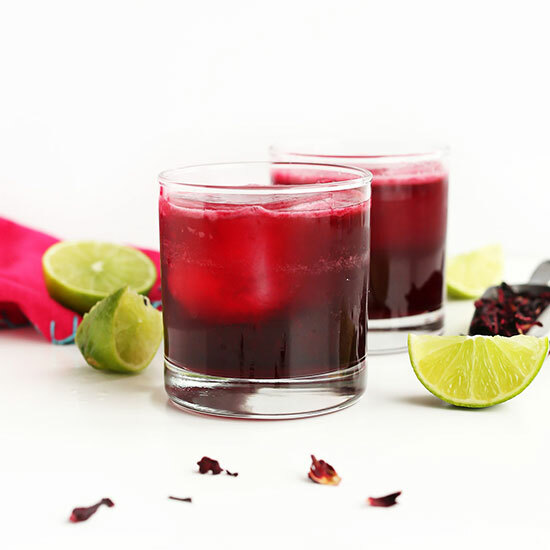 To make two margaritas, add ice, cooled hibiscus tea concentrate, lime juice, tequila and 1 Tbsp agave nectar (optional // amount as original recipe is written // adjust if altering batch size) to a cocktail shaker and shake vigorously to combine. Pour over two glasses with ice. We love this oversized ice cube mold for cocktails. Salt or sugar rim is optional. Garnish with lime wedge. If too strong, dilute with a splash of sparkling water. 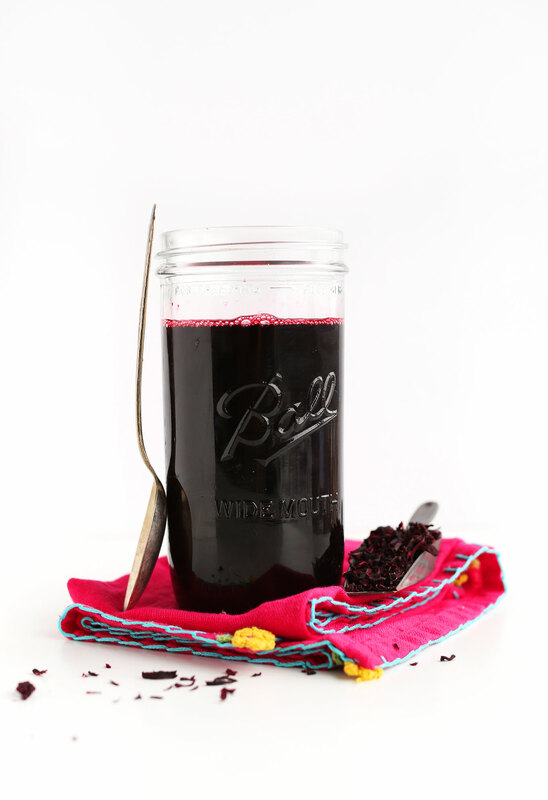 Store hibiscus concentrate covered in the fridge for up to 2 weeks, though best when fresh. *Nutrition information is a rough estimate calculated with the optional agave nectar. I don’t have silver tequila, I have gold, would that change the taste too much? You can actually grow your own Hibiscus Flowers. Renee’s Garden Seeds carries the seed. They are beautiful plants and easy to grow. I’ve been looking for a good recipe to use them in and I love Margaritas. I made these for Valentines, but in the absence of a margarita shaker, I tried it in a travel bottle. The result was a lot of foam. Dana, what would you recommend as a good shaker alternative – or is there not a good one? I have Tazo’s hibiscus tea bags at home (passion?). I’d love to make these for my girlfriends on Valentine’s Day – how would you suggest I’d alter the concentrate with tea bags? Just follow the same instructions and put approximately as many tea bags as I say loose leaf. I don’t think you could put in too many. You’re going for a deep, deep magenta color. I’d suggest starting with 10 bags? Up it from there. Good luck! I am writing down these ingredients right now and going to the grocery store! So excited for this drink. Delicious! I’m growing such a fondness for floral flavours in my food and drink. I wonder whether rose would work too? I’m not done with alcohol, but what a pretty drink this is. I sometimes make hibiscus tea and it’s so good. Tart and sweet at the same time, you can’t go wrong with hibiscus. Love this! 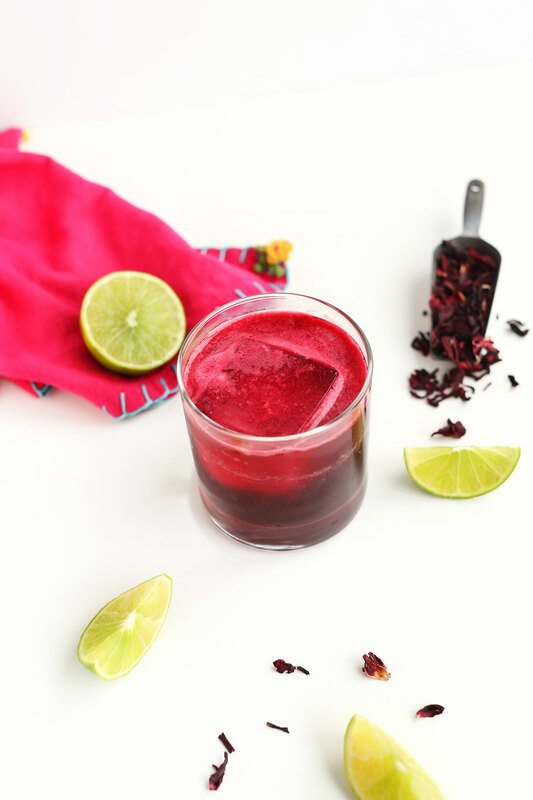 I had my first hibiscus margarita this past summer and have been dreaming of make them at home ever since. This is great thanks! I totally struggle with mixed drinks because there are often so many ingredients and I don’t know what to do! Are you still on vacation? And posting? Superwoman. I love tequila too :) These sounds utterly refreshing. I’ll have to save them for a warmer day. I love hibiscus. I love margaritas so I LOVE these! Love hibiscus and the rich color of the tea. 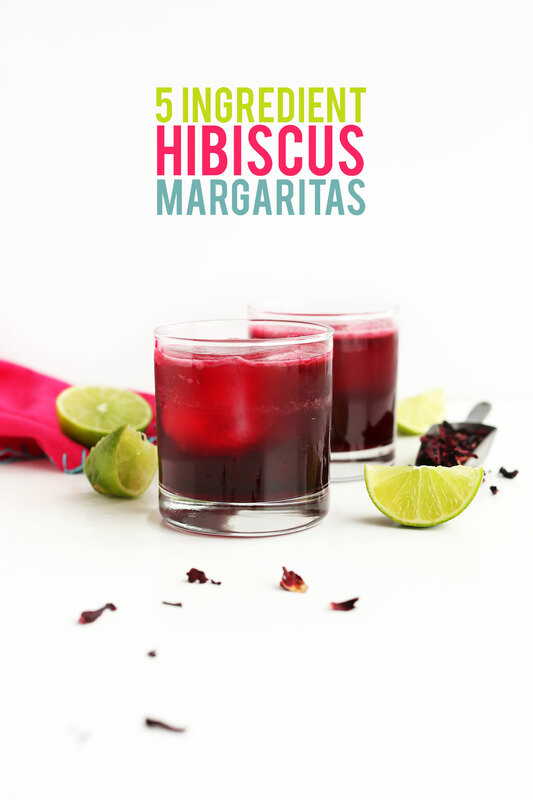 Hibiscus margarita sounds good! OH MY GOSH YUSSS. I looove tequila too and I’ve always loved sweet tart teas with rosehips or hibiscus. Even when I was younger I’d dig those rosy red pieces out of my homemade herbal teas and eat them! So THIS is everything a girl could want in the world. Tequila is my liquor of choice, so I say keep the margaritas coming! Looks awesome! Can’t wait to try it. I actually just moved to DC, would you happen to remember the name of the Mexican restaurant you went to for the bottomless brunch? I am not going to lie… I am at work but I am already thinking about how I will make these in my free time, haha. They look amazing and I bet they taste just as amazing! Omg YES!!!! A bottomless Mexican brunch sounds like My Happy Place. I love margaritas as much as you do, so I always enjoy seeing the different versions you come up with. I’d drink these with you any day! I fell in love with a hibiscus tea thing at a Mexican restaurant in Philly, so incorporating that into a margarita is just genius. im not a tequilla person but im sold on these margaritas. 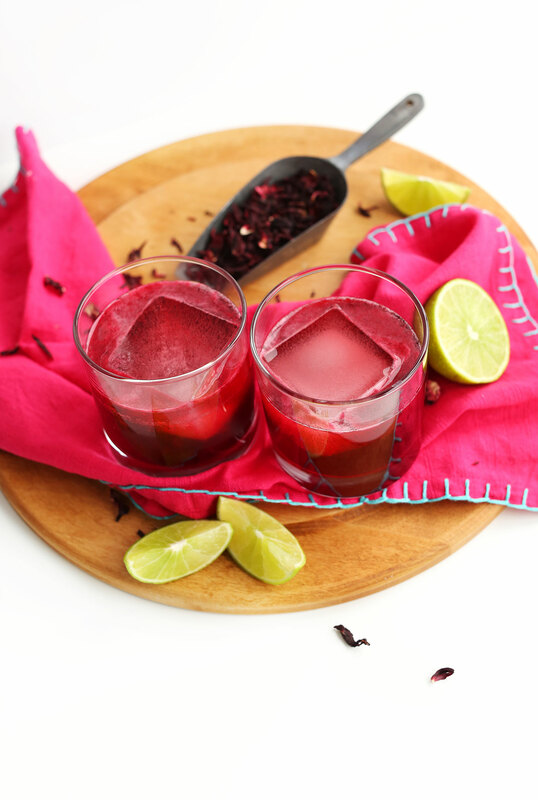 I’m loving these recipe ideas lately; hibiscus tea is something I love and I’m actually steeping a cup now! Another interesting recipe I tried at a friend’s house a couple of weeks ago is steeping fruit/berry tea in white wine. You have to steep it for a while but the results were sooooo good!